We work individually with each client to design and craft a truly singular kitchen. We begin by listening carefully to your space concerns and needs, in order to gain an understanding of what needs to grow out of our collaboration. We create a design concept that merges your vision with our expertise, to create solutions that are truly optimal for how you will use your kitchen. Everything from the appliances you have, to the particular workflow the space will accommodate, is considered. We build your custom kitchen to the highest standards of craftsmanship. At Urban Homecraft, all our kitchen cabinets are handmade by expert craftsmen in our Brooklyn studio. The end result is a custom kitchen that is beautiful, functional, and truly one of a kind. Urban Homecraft's services go above and beyond simply designing and building kitchens. We coordinate with any suppliers or contractors, and manage the entire project from initial conception to installation, making the process as comfortable and seamless as possible. This kitchen was refaced with modern finishes and pulls. The clients opted for a dark stain with steel appliances. There was a nifty compartment for stemware that was hidden behind a hatch door. The white slab-front cabinets of this kitchen contrast with the dark backsplash. The cabinets are made of colorfin, a Finnish birch plywood. The backsplash is made of "Nero" tile. The counter is a Chenille White honed limestone. Strip lights were installed underneath the upper cabinets to illuminate the countertop. This was the second project for a client who cooked a lot, and never let us leave without baked goods. It was designed to assimilate with the large collection of Asian furniture in the rest of the home. Before the renovation, the kitchen was a dark hole with a narrow entryway that deprived the clients of their stunning north-facing view of the NYC skyline. We knocked out parts of the entryway wall to create more of a view. We also discovered that there was wasted space (two feet!) above the ceiling, so we raised the ceiling of the kitchen to create more cabinet space. It was a tiny space, but we wanted to fit a steam oven, convection oven, large fridge, dishwasher, and microwave, all without compromising counter space. The solution we came up with to incorporate the steam oven, was to place it high up and pushed deep through the wall. We cut a hole into the wall and pushed it back (underneath an adjoining staircase); this way we had a 24 inch oven protruding only 12 inches, so it would be flush with the upper cabinets. We also saved space by making a cabinet under the sink for the garbage can, which was on a slide-out drawer. The cabinets were rift white oak, the countertops granite, and the floors slate. 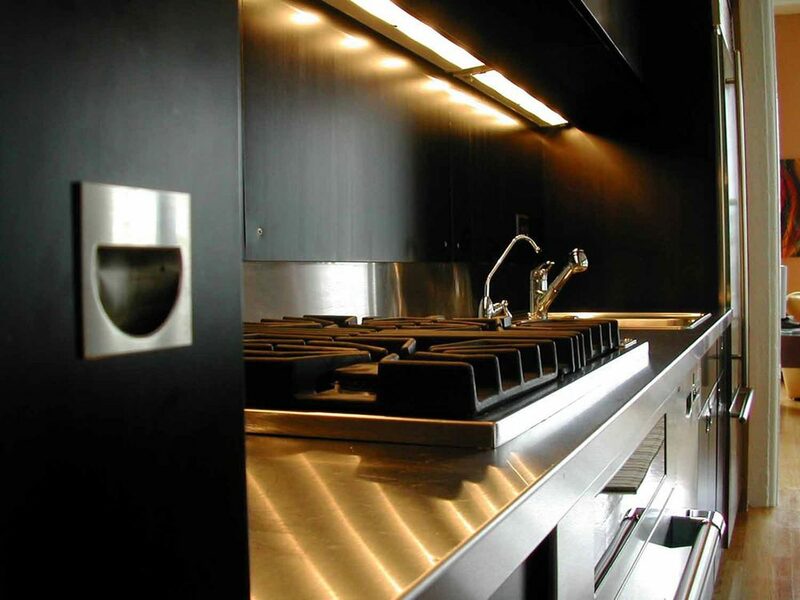 Under-cabinet lighting was LED, and a stainless steel pegboard was included for pans and a magnetic spice collection. Here the white cabinetry under the counter expands the available storage space in the kitchen. The drawers are of mixed depth and take advantage of all the available space under the counter; the drawer closest to the wall is deep (going as far back as under the expresso machine), while the other two are shallow. This kitchen features cedar wall cladding and shelves, with a sliding glass door. A fold-up kitchen work surface saves space and keeps things open for this compact kitchen. Beware of the ill-planned kitchen bar area; it invites you to pull a stool up and socialize with the cook, but as you do, you bang your knees, because whoever designed the countertop only allowed 6 inches of overhang. Your options are: you can either replace the whole stone countertop to overhang at least 14 inches, or you can surrender and turn it into useful space for something else, like storage. This couple loved to entertain and wanted a place to keep drinks, so we claimed this space for liquor bottles.